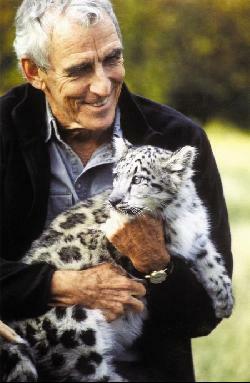 I finally got hold of the late Peter Matthiessen’s classic, The Snow Leopard, after a several week delay at Amazon, which was out of it. I had never read Matthiessen before, even though I knew he was a fervent lover of nature. He began writing the book back in 1972, essentially a daily journal, shortly after the death of his wife, Deborah, from cancer. It tells of his trek across the Himalayas with field biologist George Schaller in quest of the Himalayan blue sheep and, for Matthiessen, in particular, the elusive snow leopard. It would win the National Book Award on its publication in 1978, our country’s most prestigious literary award. I, too, confess to loving nature intensely to the point that my graduate prof in a Wordsworth course told the other students I had a leg up on comprehending Britain’s foremost nature poet. In the middle part of my boyhood we lived in Philly, and I do mean the city. Occasionally we’d drive over to the Jersey coast for relief from the asphalt oven that is Philly in summer. For me, it was liberation to be among trees, fruit stands, and the shore. I used to travel a lot, often abroad, always with camera ready, but I got complaints that there weren’t any people in my photos. I simply preferred landscape and I’m still that way. But back to Matthiessen, I read several tributes following his death in April and even wrote my own in Brimmings a few weeks ago. I knew I had a lot of catching up to do. After all, he wrote some 33 books, both fiction and non-fiction, excelling at both. Certainly, I had to read The Snow Leopard after coming upon one reader’s comment that he goes back to it every year, always gleaning new insights. For someone to do this–it’s rare we re-read a book, let alone, continually–implies considerable substance. After comments like that, how could I not want to splurge my time indulging in this book. Out of curiosity, I googled “nature classics,” only to be disappointed to find no mention of the book that deserves company with the likes of Thoreau, Muir, Carson and Leopold. Perhaps it’s because The Snow Leopard, while surely taking in nature with eagle eye observation recorded in some of the most elegant prose ever, moves past nature into spiritual autobiography. In brief, the outer search for the snow leopard ultimately symbolizes his inward pilgrimage to find meaning and, with it, himself. Amazingly, we take for granted that instinct for survival, fear of death, must separate us from the happiness of pure and uninterpreted experience, in which body, mind, and nature are the same. And this debasement of our vision, the retreat from wonder, the backing away like lobsters from free-swimming life into safe crannies, the desperate instinct that our life passes unlived, is reflected in proliferation without joy, corrosive money rot, the gross befouling of the earth and air and water from which we came. I wasn’t prepared for how unflinchingly honest this book is: “I am aware of all that is hollow in myself, all that is greedy, angry and unwise.” Matthiessen acknowledges that things were not well in his marriage with Deborah. There follows his intuitive decision to commit; his ineffectual attempts to show love. After her death It would be a year before this prolific writer found himself able to take up the pen again. Deeply sensitive and rich in compassion, he is always aware of the plight of nature continually ravaged by humans in their relentless self regard and unbridled exploitation. He laments how even the Himalayas are being depleted of their forests, unsafe despite their remoteness, and with their loss, a habitat that gave sanctuary to unique animals like the blue sheep and snow leopards. Always in Matthiessen you have a sense of a paradise lost, with Man the driving agent of its extinction. I wish I had time to explore the depth of the book’s many insights, for The Snow Leopard is surely a repository of cerebral wrestlings, an exploration of what it is to live meaningfully in the context of impermanence frequented with suffering. Accordingly, neither the past nor the future really matters, for it is in the Now that we find our paradise and thus our deliverance. …almost everywhere, a clear and subtle illumination that lent magnificence to life and peace to death was overwhelmed in the hard glare of technology. Yet that light is always present, like the stars of noon. Man must perceive it if he is to transcend his fear of the meaningless, for no amount of “progress” can take its place. We have outsmarted ourselves, like greedy monkeys, and now we are full of dread. This entry was posted in Books, Environment, People. Bookmark the permalink.